Originally published in the Tico Times on June 7, 2014. Click here to read online. The comments came after two weeks of radio silence from the Diria following the airport shutdown, which caused local residents and business owners to fear they were losing their airport for good. Without it, the town’s tourism-drive economy would take a hit, residents said. While the Diria’s recent statements cleared up some of the misconceptions and put minds at ease, important questions about the airport’s future remain. The Tamarindo airstrip lies on a large piece of the Diria’s privately owned land; land that is home to a driving range and may become a full-scale golf course. With signs, billboards and the recent completion of a model home advertising a future residential golf community, it’s no secret that the Diria has plans for the area. According to a statement made by Civil Aviation at a recent meeting, its authorities first began sending safety reports to the Diria in 2009, informing the administration the runway needed attention. Five years passed and more memos were sent, but no one from the Diria responded. 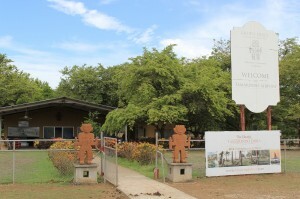 The Tamarindo Diria Airport Sign – Airport still closed. So when the airport was temporarily shut down, some local residents feared the worst. One of them was Guido Scheidt, a pilot and area resident whose company, Auto Gyro America, has flown scenic gyrocopter flights from the Tamarindo Airport for over five years. He organized community fundraising to fix the runway, but once he heard the Diria’s statements, Scheidt admits the effort may have been premature. Diria representatives told the group they remained silent until now because they had been negotiating with construction companies and contractors to determine a budget for runway repairs. When it comes to Diria’s long-term plans for the airport, Rockbrand and other Diria representatives have declined to comment. The uncertainty over the airport’s future has created frustration for Tamarindo businesses – particularly three real estate conglomerates reportedly interested in donating land for a new public airport. Those projects include Reserva Conchal in Flamingo, Hacienda Pinilla in Avellanas and a group in Tempate. Once a location is chosen, the project could take up to three years to complete. Business owners say they are eager to get started and disappointed with lack of information coming out of the Diria. For a new runway to succeed in this region, it would rely on the service of regional airlines Sansa and Nature Air – both of which seem unlikely to add a new route so close to Tamarindo’s airstrip, should it remain open. As for an exact date for the reopening of the airport, Rockbrand didn’t know. But the public can expect an announcement soon, he said. Originally Published in the Saratogian: December 19, 2011. Click here to read online. SARATOGA SPRINGS — Holiday shoppers have one more chance before Christmas to get locally made goods and gifts at the Saratoga Farmers’ Market, now in its indoor season at Division Street Elementary School. The school transformed into a holiday-themed market this past Saturday, brimming with shoppers who spent time catching up with friends while browsing local gifts and groceries. For those looking for last-minute gift ideas, the farmers’ market will be open again from 9 a.m. to 1 p.m. Saturday, which is Christmas Eve. “We’ll be here for the holidays. Believe it or not, gardens in New York state still produce at this time of year,” market coordinator Suzanne Carreker-Voigt said. Like Carreker-Voigt, most of this weekend’s market shoppers were buying a mix of gift items, like handmade jewelry or homemade jams and fresh food items, including locally grown greens, meats and seasonal vegetables. “I just got four pairs of earrings for my mother,” said Charistienne Budge, a frequent market shopper who was doing her Christmas shopping there for the first time this year. “It’s really nice, and I have to say, it’s a lot more pleasant than going to the mall,” she said. 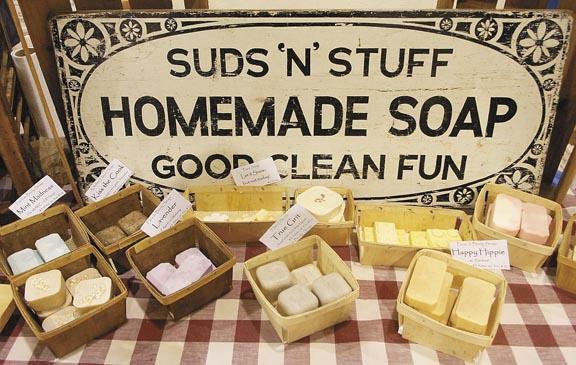 Along with jewelry made by local designer Frenchy Loeb, Budge picked up some Saratoga Suds soaps as gifts and knocked another item off her list with ground mutton and a family recipe from Elihu Farms, which she planned to make for an upcoming holiday party. Linda’s Country Kitchen is offering Santa Claus cookies, a popular item amongst shoppers and vendor Linda Kerber’s eight grandkids. For Christmas Eve shoppers, Linda’s homemade pies offer a fresh (pies are baked the day before the market) and tasty dessert option for a holiday party. “I kind of specialize in baking for the holidays. I’ve been baking since I was 10 years old. We have pies, cheesecakes, cookies and probably more at Christmas,” Kerber said. Amy Bonser Feldman’s twin daughters, Miakoda and Kestrel, were occupied by smoothies and honeycomb while their mother shopped. The Saratoga Farmers’ Market and most of its more than 30 vendors will return Saturday for last-minute gifts and other local goods. “We’ll be here, so if you’re really up the creek and can’t think of what to get, there’s nothing better than a basket of local goodies,” Carreker-Voigt said. The Saratoga Farmers’ Market will also be open during regular hours New Year’s Eve day, which is Dec. 31. For information, go to www.saratogafarmersmarket.org. Originally Published in the Saratogian: December 11, 2011. Click here to read online. That’s the question posed to small businesses by Local Living In, a Ballston Spa-based marketing company geared toward driving local consumers into local businesses. The idea for Local Living In developed from a need Klingenberg noticed while running his other business, a small design company called Hound Dog Graphics, located on the Saratoga Springs-Ballston Spa town line. “We noticed our smaller business clients were struggling with how to best spend their limited marketing dollar,” he said. Local Living In offers clients a solution. For a $49 monthly membership fee, businesses earn a multimedia marketing package, which includes a business profile on www.LocalLivingIn.com and access to email, Facebook blasts and other Local Living In marketing campaigns. Local Living In also offers a Buy Local program that gives consumers an incentive to spend their money in local shops. When making a purchase, customers present the free Buy Local Rewards card at any participating business to receive a Buy Local offer determined by the retailer that could be a special discount or freebie. When Local Living In first launched in 2010, it included the “pocket communities” of Saratoga Springs and Glens Falls. After amassing more than 5,000 email subscribers in those cities, Klingenberg expanded Local Living In to Ballston Spa, Malta, Glens Falls, Clifton Park and most recently Albany. “We’re now just getting ready to launch Schenectady and Amsterdam. And hopefully by the end of January we’ll launch Plattsburgh, Syracuse and Burlington, Vt.,” he said. The more regional businesses that join Local Living In, the more encouraged customers are to use their Buy Local card. With the card, customers can capitalize on the business’s Buy Local deals from Broadway to Burlington. Retailers can also update offers whenever they change, like when the stock of items runs out. Businesses can sign up for two Local Living In membership packages. Businesses that can’t offer giveaways but want to be in the Local Living In directory can choose the $25 monthly option, which includes a basic presence and business listing on the website. The $49 package includes multimedia marketing, social media callouts and email blasts, Klingenberg said. Customers can sign up for a free Buy Local card at participating businesses or at www.locallivingin.com.